Britain's greatest seaside resort. 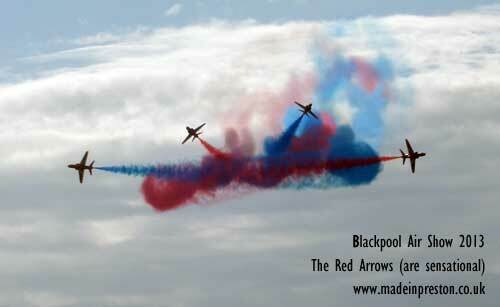 Turn off the M6 at Junction 32 onto the M55 and drive into the centre of Blackpool. The motorway leads onto Yeadon Way which was the old railway line that went to Central Station. 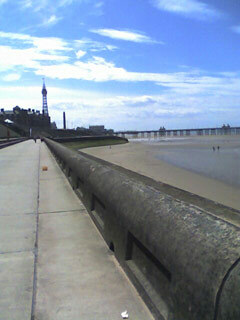 Seven miles of promenade plus another seven to Fleetwood. 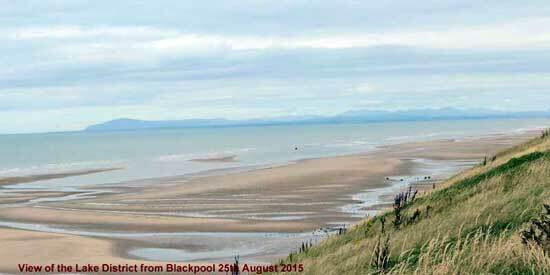 20 miles of beach on the Fylde Coast. 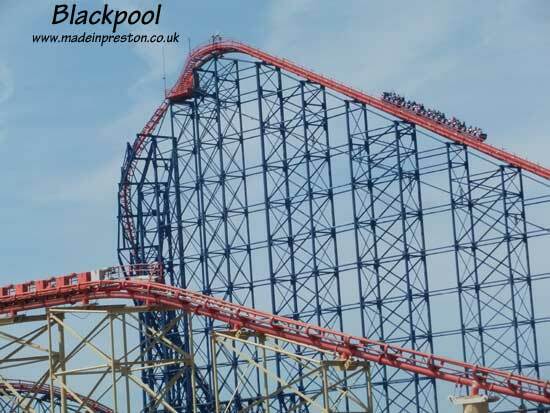 The Big One at the Pleasure Beach is visible from well outside Blackpool and can give the impression you're going into the sea. 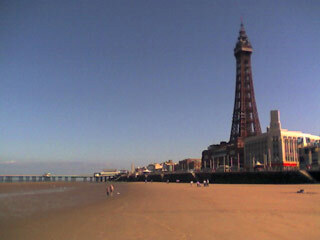 Blackpool Tower, a landmark seen from afar and probably the best known and most recognised seaside icon in Britain. 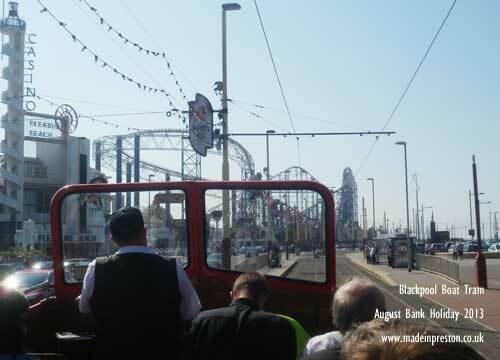 This open top double decker is the cream of Blackpool Heritage Tram Tours. Notice the heritage tram stop special sign. They don't stop at the new tram stops. 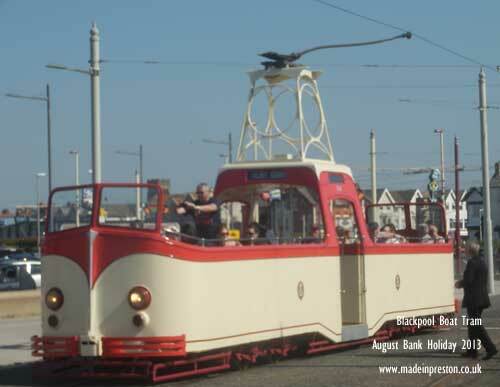 This single deck open top tram is also in the cream. The Frigate Illuminated Tram. Life without limits. From the cliffs on North Shore the Lake District is visible, and the peaks of Wales on a good day. North Pier the first of the three Blackpool Piers, built in 1861 by a Scottish construction company. Coral Island on the prom, land of slot machines. 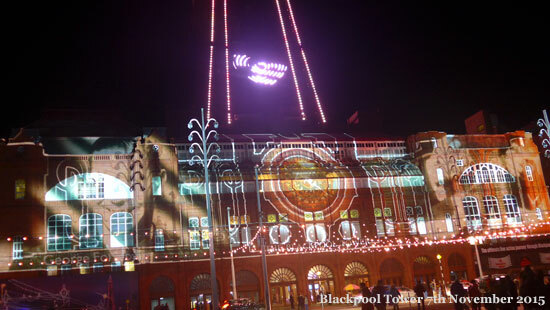 Blackpool Town Hall in Talbot Square. 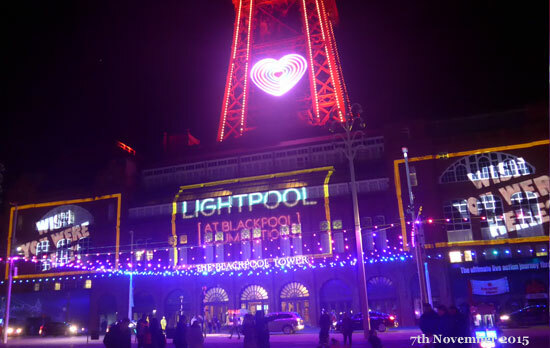 Blackpool 'Lightpool' display on the Tower Building 2015 illuminations season. A ten minute light show with music every 30 minutes. 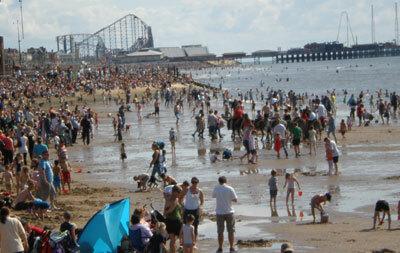 A lot of rebuilding has taken place in Blackpool in the last 10 years. 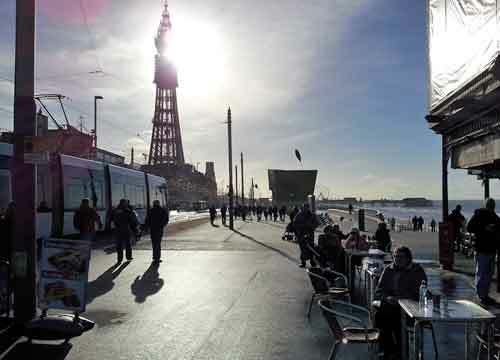 Most noticeable are the promenade headlands and new tram system and shared traffic space along the prom. The Council have moved their offices to Talbot Road and a large modern office block outside North Station. There is a major update to Talbot Road Car Park which is now a secure and locked multi-storey car park. The Houndshill Shopping Centre has been extended. Merlin Entertainments have added their weight to the offer in the Tower, Madame Tussauds and Sea Life. 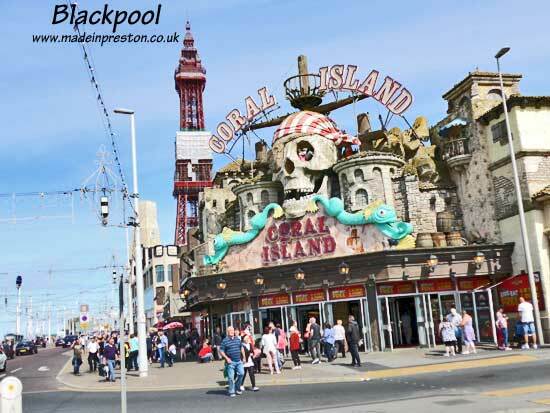 The Pleasure Beach has had major new rides added in the last 2 years including Nickelodeon, Wallace & Gromit Thrillomatic to add to the thrill rides. 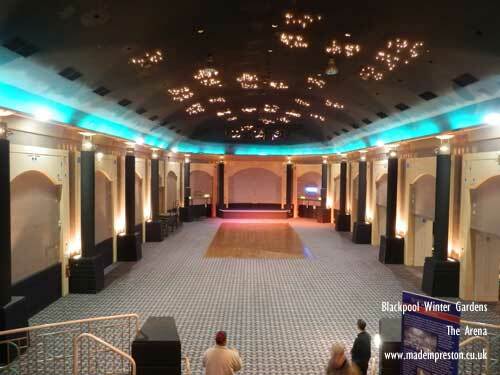 The Winter Gardens has had a big refurbishment to bring back its classic elegance. Stanley Park had ?5m spent on it as well and the childrens play areas, lake and cafe are in good condition. The Zoo is continually expanding. Next door to the Zoo, Blackpool Victoria Hospital has transformed many of its buildings and added new ones. The latest is a modern entrance and a multi-storey car park so big it can be seen from far away. 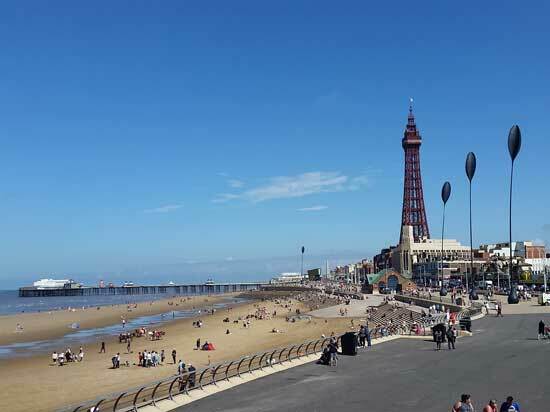 Blackpool Council bought the Tower and Winter Gardens and Merlin Entertainment are running the Tower with new attractions. The tower itself is being fully repainted removing all the old paint, a big job due to be complete in late 2015. An observation platform at the top with a big walk of faith, a Dungeon and the glass sun lounge restored. 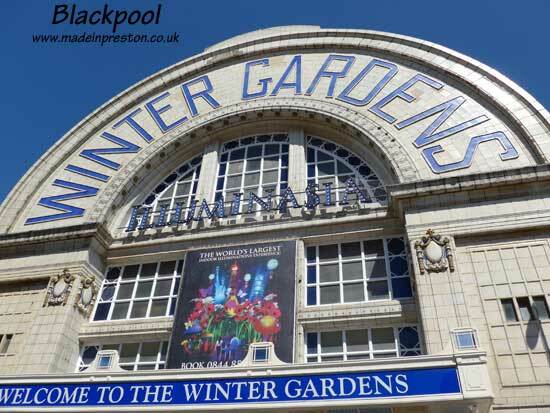 The Winter Gardens is now looking very attractive, almost like new. 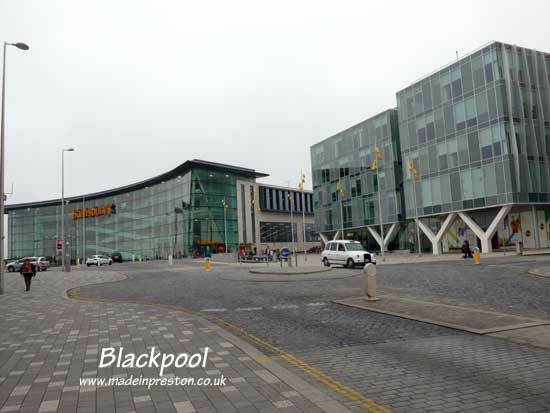 The Pleasure Beach has invested ?10m in the Nickolodeon attraction in 2011 and ?5m in 2012. Check for opening times. 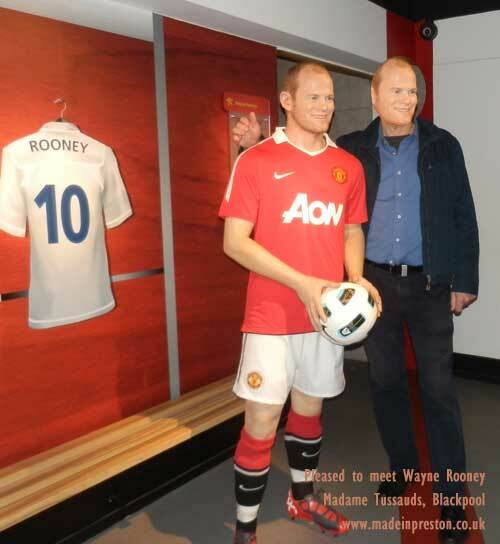 Merlin have revamped the Madame Tussauds building and added new wax models that look very good and this opened in April 2011. Having visited in April 2012 I'd have no hesitation in recommending it. Me and my Wayne look on meeting Wayne. A new light rail style tramway was completed in 2012 and has been an amazing success. 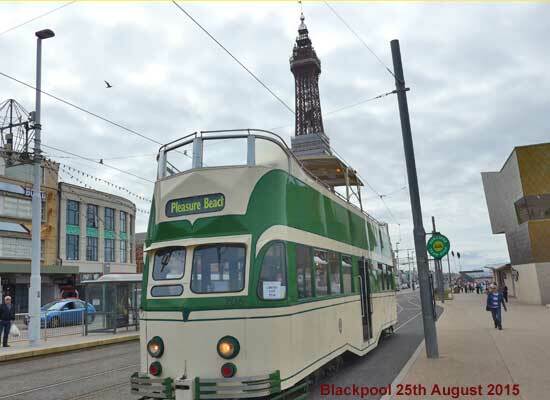 This has modern longer, smoother running trams and some of the traditional trams owned by Blackpool Council have been upgraded to be compatible. Traditional non-upgraded trams operate special services called Heritage Trams that have separate stops at the side of the track. In 2013 these are only running at bank holidays. 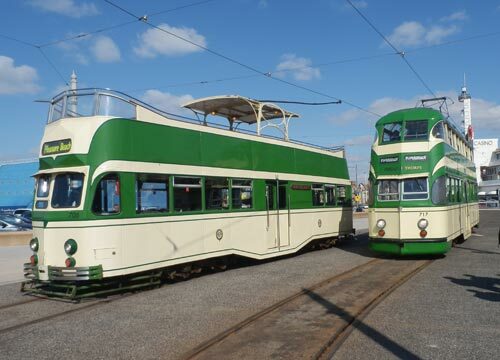 Both of the trams below were made in Preston. Easter 2013. The new tramway has a modern new depot on South Shore just beyond Starr Gate that will replace the old one on Rigby Road. The promenade between South and North Pier has been almost completely rebuilt with headlands extending the prom further out. A new very modern wedding chapel has been built on the promenade close to North Pier with views out to sea and up towards the Tower. A smart new cafe has opened in the building as well. 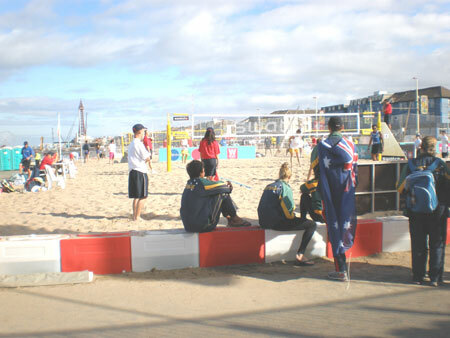 While the prom has widened pavements , the Tower Headland was opened with a show by Elton John on June 16th 2012. 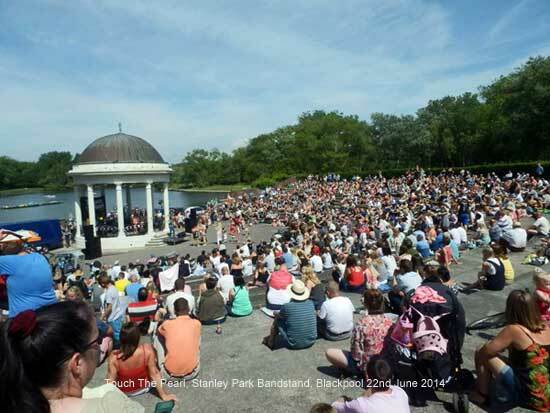 The free bandstand shows get big turn outs for certain groups. 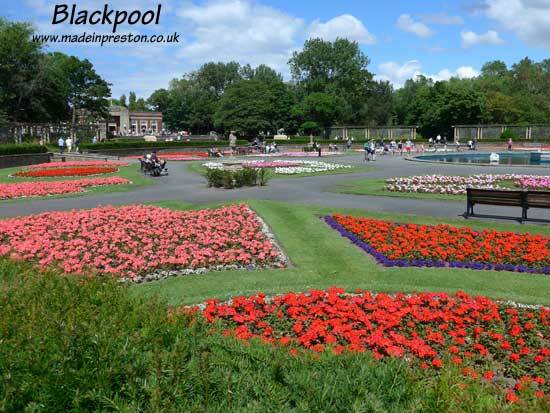 Stanley Park is a Grade II listed park of local, regional and national significance. Designed by the well respected landscape architect T H Mawson in the 1920s and opened by Edward George Villers Stanley (from whom the park gets its name) in 1926. The parks importance stems from the quality of the original design as T H Mawson had a great affinity for the Arts and Crafts movement in vogue in the 1920s and the fact that the overall layout has changed little since its opening. Although some significant assets came later, such as the cafe building, (a fine example of the Arts and Crafts style of architecture) and Cocker Memorial Tower, being built in the 1930s. These elements are regarded as integral features of the park that add to its value. The park has recently been granted a large sum to restore many of its features and work is now well underway. A new visitor centre has been built and the cafe is serving good food inside and 'al fresco'. Just across the road from Stanley Park is the Zoo which has recently been modernised. Blackpool Zoo has an interesting history. 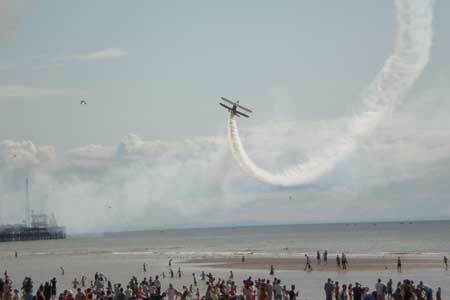 It was the Stanley Park Aerodrome and the main buildings are the original Art Deco Hangers. The Air Traffic Control Tower is still visible on top of one of the buildings. Inside the Zoo entrance hall is an interesting exhibition showing photos of the aerodrome and the history of the zoo. 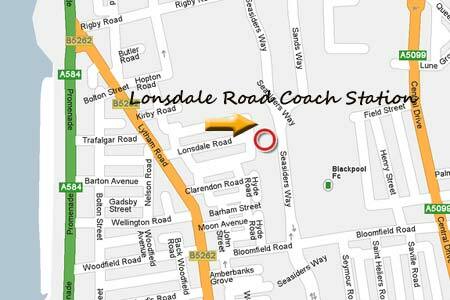 Lonsdale Road Coach Station, Blackpool - Where is it? What is it like? 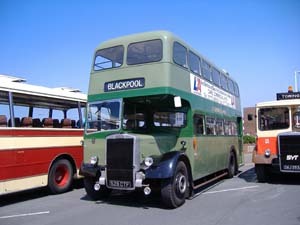 In Sept 2009, had cause to take someone to Lonsdale Road Coach Station in Blackpool. I looked at the map and couldn't find it. So I decided to take the obvious route and go along Lonsdale Road to the end. 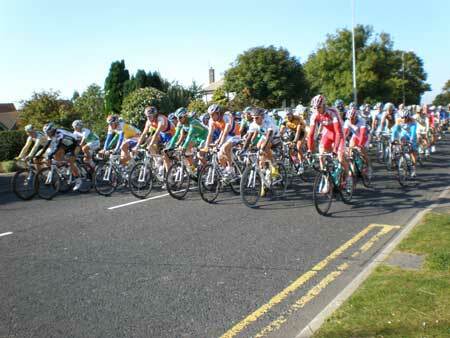 Lonsdale Road is close to the prom off Lytham Road. Surprisingly coming from the prom direction there seemed to be no signs. Also when you get to the Coach Station the sign is fairly well hidden. 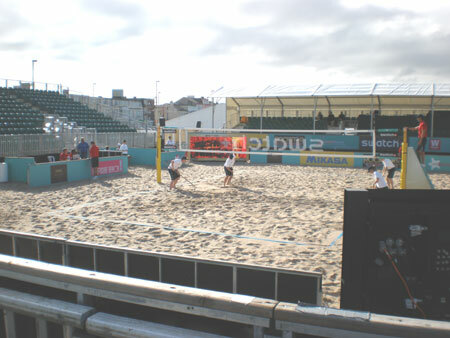 It is next to Blackpool FC, Bloomfield Road football ground. The ground has been rebuilt, there is a large new metallic looking Travelodge next to it. The coach park and it's associated car park is part of what I have heard is the largest car park in Europe that runs for about a mile along the ex-railway line from South Shore up to Central all smartly newly done. The coach station building is quite small but is fairly modern and has a waiting room, shop and toilets and covered areas. When we were there at 7.30am it seemed closed and there were no coaches and hardly any cars. 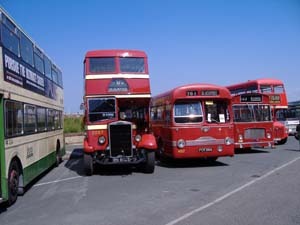 Although it looked like there is space for 40 coaches and a number of covered loading bays. Note Central Pier is just off the top of the map. From Lytham Road turn into Lonsdale Road and it takes you straight onto the Car Park which has restricted height access. You can also access the car park from Seasiders Way. I'm not sure you can turn into Seasiders Way from Bloomfield Road. There seem to be a lot of arrows that people ignore although it was deserted when we went. 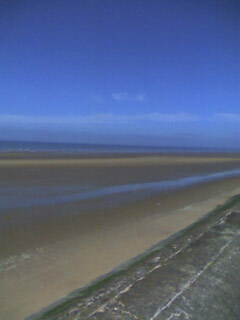 We walked from Bispham to Central Pier, about 2 miles, on 21st September 2008 and it was a beautiful day. North Shore always looks good from the cliffs although it was a bit misty. At Central on the beach there were still lots of donkeys seeming to be doing a good trade and the horse drawn Landau's were looking good. 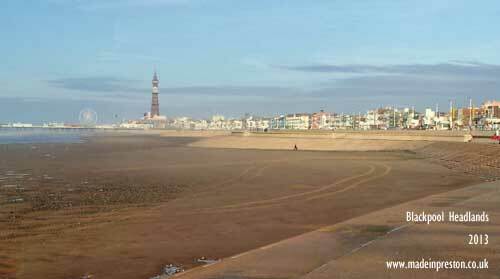 The sand and the new promenade wall was looking clean, I often think Blackpool has good, golden sand great for walking and there were a few making castles. After the walk we went to Barista, which closed in 2015, in Birley Street for a coffee and a Baklava and then walked back, it was getting warm in the sun at that time. There was an old soldiers ceremony (Aden Veterans) at the Cenotaph with the Brindle Brass Band - I recall the band playing before the match at PNE in the 1950's. The band started leading the old soldiers along towards the Imperial but we were walking faster so don't know what happened. Jubilee Gardens just past Gynn Square was pleasant as it's a bit of a sun trap. The tram track at North Shore has now been replaced. We'd parked our car across from the illuminations tableaux so had a good close look at them before going home. The central area is being re-developed into a grand gateway entrance. Central promenade is being extended by 60 metres into the sea to create a curved shoreline and provide long term flood protection. 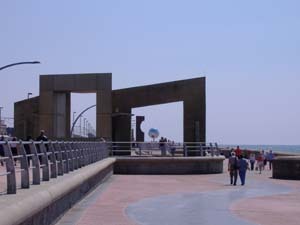 South Shore promenade has been rebuilt with a raised promenade and furnished with modern statues. North Shore retains its genteel elegance with Edwardian front hotels and its triple level promenade reaching up to the cliff top. Blackpools resources are second to none. 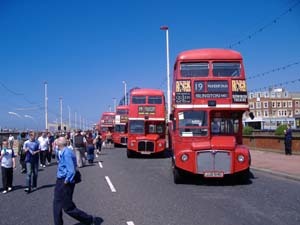 Most of them were built during Blackpools heyday but new investment is gradually bringing them up to date. Although at least two of them are needing too much investment. 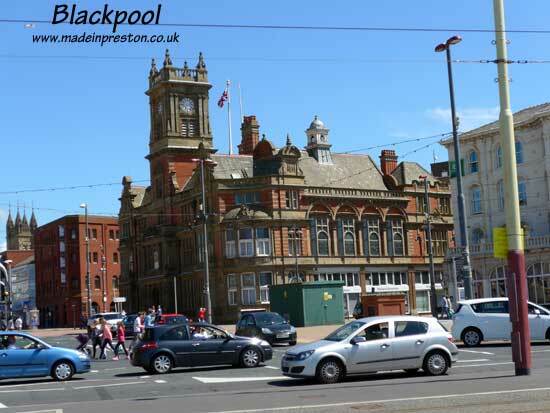 Not many places have; 7 miles of well paved promenade with tram service, 3 piers, tower with ballroom, pleasurebeach; Pepsi Max Big One, Zoo, Stanley Park, Grand Theatre, Winter Gardens, international airport. Hotels and B&Bs by the hundred to suit all pockets. The beach has excellent quality of sand and at low tide the sea varies from about 200yds out at North Shore to much more at the southern extremities. It's downside is a large number of low quality shops in the holiday areas. Stanley Park has had ?5m spent on its rejuvenation and is almost complete. There are groups and bands playing there in the summer (list of events). 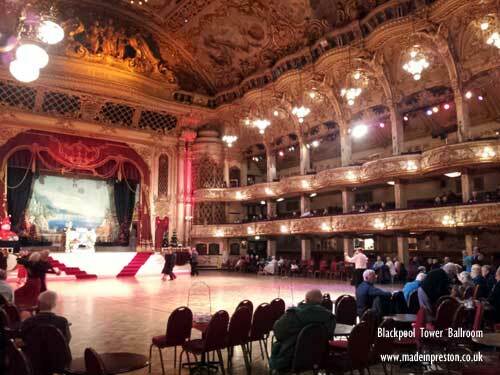 Blackpool is also a famous name in ballroom dancing with the Winter Gardens hosting world competitions. 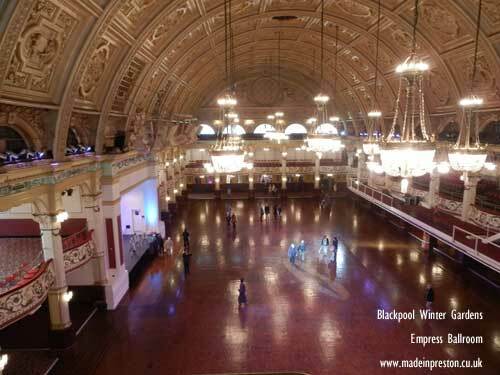 In 2007 the government decided Blackpool would not get a super casino, it would go to Manchester. In May 2007 the PM announced that the super-casino might not be built at all. 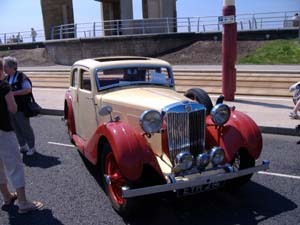 Why not walk from South Pier to Fleetwood along the promenade and get the tram back. If you have the strength, allow about 4hrs non-stop including return. 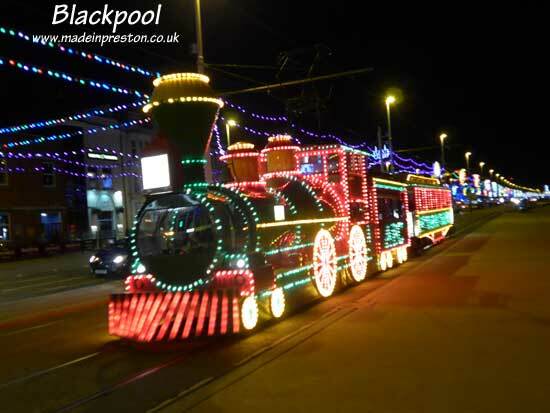 You can also stop at Bispham or Cleveleys and get the tram back. Cleveleys is having its promenade developed with modern features, Cinema, cafes etc. In August 2008 the extension to the Houndshill Shopping Centre opened and it is a big improvement. 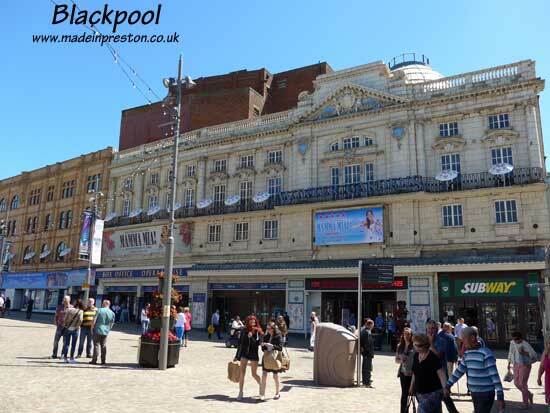 The flagship store is a Debenhams and a number of other new shops have come to Blackpool and others have re-located from the surrounding area. At the moment (Sept 08) there are 3 large corner shops empty with Clarks opposite the Grand Theatre, Next opposite the Wintern Gardens and Harveys opposite the old Post Office all having re-located. Harveys has gone to Squires Gate. Also the promenade is progressing well with the 'lagoons' now nearing completion and plans for the extended land areas being made. In 2009 areas of grass have been planted on the prom - that's new. 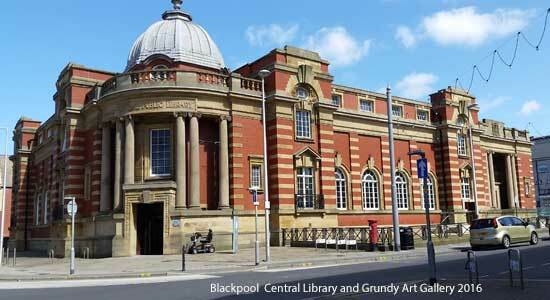 List of listed buildings and blue plaques in Blackpool on the Blackpool Civic Trust website. In 2012 the promenade is finished with a Comedy Carpet in front of the Tower, worth a look for a giggle. 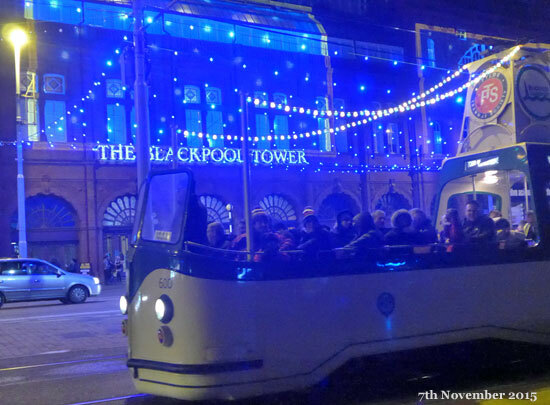 Blackpool Promenade in November 2012. 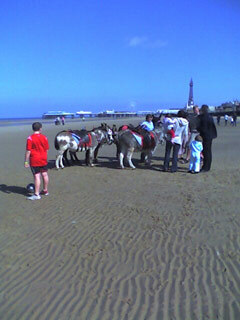 BLACKPOOL 1ST MAY 2005 USING MY MOBILE PHONE CAMERA (which at the time seemed pretty smart). Had a great walk at about 10am from Gynn Square, under North and Central Piers then to South Pier and back into town for a coffee. 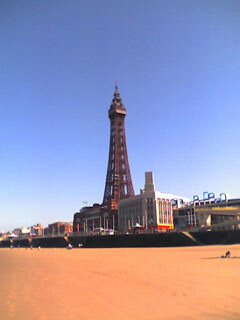 BLACKPOOL TOWER. 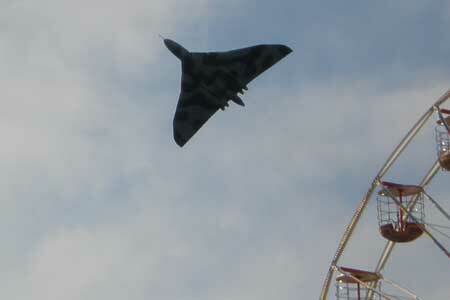 From close to Central Pier. Look at those sands so beautiful it makes you want to return. Same view as above but with a bit of North Pier. 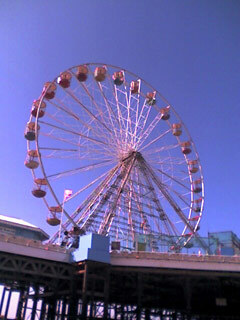 Big Wheel on Central Pier. Big One at South Shore in the distance. Close up of the Central Pier Big Wheel. Look at the sky so blue it makes you want to return. Donkeys on the beach, having a good time. Walking along North Shore towards Gynn Square along the lower promenade of the 3 levels. North Pier and tower. Looking towards the Lake District from North Shore. Look at the sea so blue it makes you want to return. 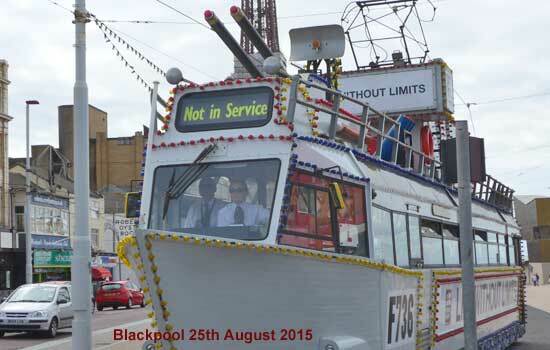 Photographs of the annual Blackpool Totally Transport Show. June 2005, South Shore. 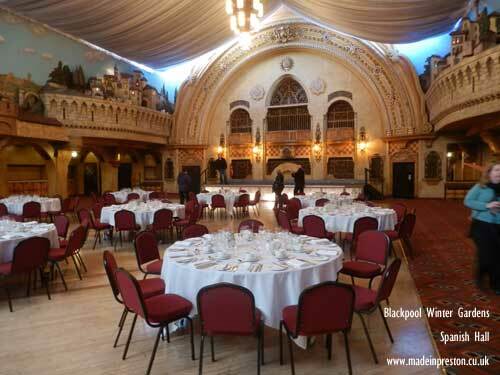 Blackpool Civic Trust has a list of heritage buildings, blue plaques and a Heritage Trail Walk on their website. 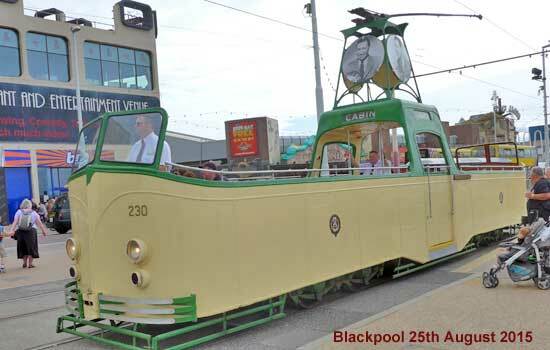 To celebrate 125years of trams in Blackpool special events and a special website have been set up. 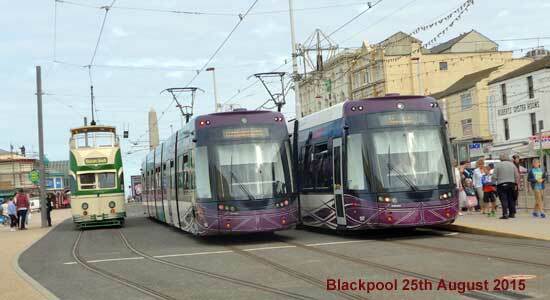 This includes trams driving lessons, a gathering of special trams between 23rd and 29th September 2010. 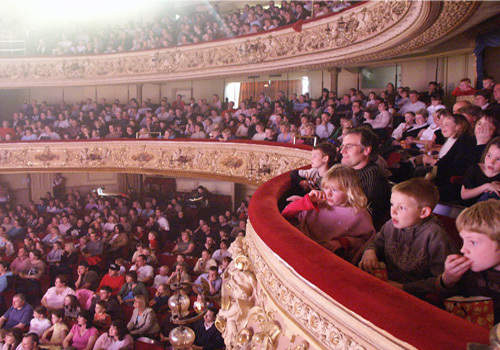 A Matcham designed pearl of a theatre, recently renovated and showing a wide range of presentations. Join Friends of the Grand. August 2007 new seats are being installed to give more leg room. 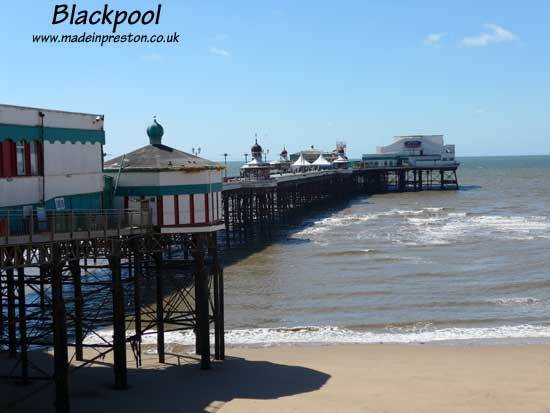 From their website 2009: Pleasure Beach Theme Park / Amusement Park, Blackpool is Britain's top, tourist attraction and welcomes nearly 6 million visitors annually. 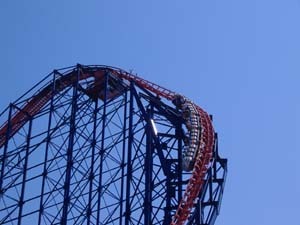 It lies in 42 acres, started with just one ride in 1896, and celebrated its Centenary in 1996. Get ready to immerse your senses as Pleasure Beach Theme Park / Amusement Park introduces Infusion, the brand new white-knuckle wave. Five incredible loops and rolls plus a double line twist all in one suspended looping coaster. Dare to leave behind dry land and duck and dive around a spectacular starburst fountain, dodge cheeky wet jets and dart through a heart-stopping, curved cascading waterfall as it gushes breathtakingly close to riders. Closed in 2015 to the main traffic although light aircraft, helicopters and some commercial services still operate. 21st May 1863 North Pier, 1650ft. The 'posh' pier built at the end of Talbot Road and next to the Clifton Hotel. Later fitted with a steamer jetty and an 'Indian Pavilion' destroyed by fire and replaced. It was hit by 2 ships in the second half of the nineteenth century and needed repair. Soon after opening nearly half a million people a year were paying the 2d entrance fee. 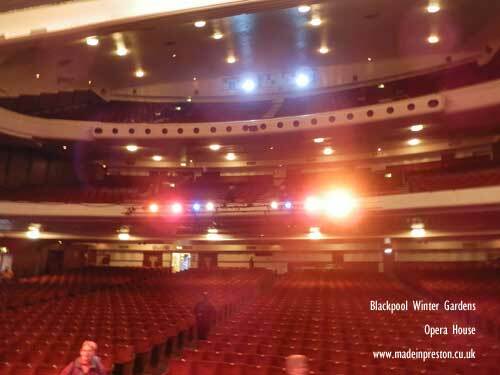 The pier theatre has been host to many well known names and is still open. 30th May 1868 Central Pier (originally South Jetty), 1110ft. Set up by a breakaway faction of the North Pier owners it wasn't a success until streamer trips to Southport were begun with music and dancing on the pier. At that time this pier was thought too far away. The steamer trips increased until a peak in the 1930's. 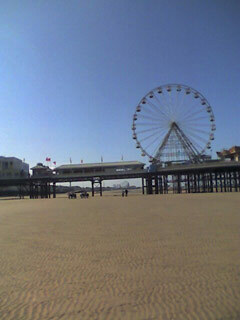 A big wheel and other attractions are now on the pier. 31st March 1893 South Pier (originally Victoria Pier), 492ft. 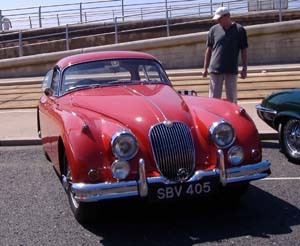 The south pier opened with a fine theatre and buildings and proved very popular. 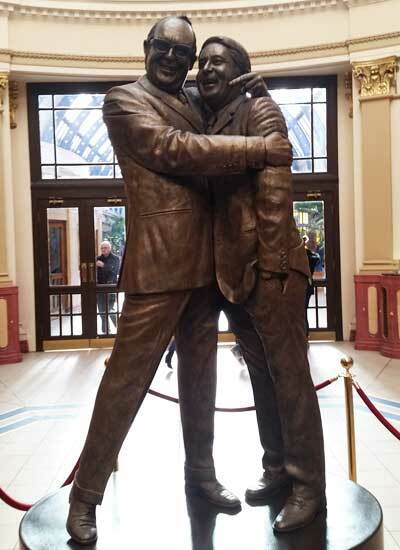 The theatre was burnt down twice and then replaced by a white knuckle attraction. It is located across from the Pleasure Beach and a large open air pool was built next to it where beauty competitions were very popular. The open air pool was removed and an indoor water attraction, The Sandcastle, built.